Izmir is the third biggest city in Turkey. Izmir port is an important stop for cruise ships for whole year. Izmir shore excursions are not to be missed. It is a good destination for travellers not only because the city is known as the pearl of Aegean region but also it is located very close to a world famous ancient city: Ephesus, the pilgrimage shrine for Christians: the House of Virgin Mary, the Basilica of St John who spent several years in the area to spread Christianity and the Temple of Artemis which is one of the seven wonders of the ancient world. If your ship docks at Izmir port then you mustn’t miss the chance to visit Ephesus and the surroundings and join an Izmir Shore Excursion. 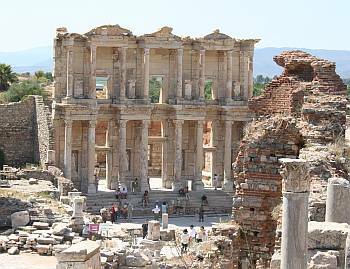 EphesusTours.biz is an Ephesus tour expert since 2000 with thousands of tours arranged for more than 30 thousand people. Izmir port is visited by cruise ships whole year. Most of them are in the area for 8-9 hours which is enough to visit Ephesus which is one of the most important ancient cities in the world. 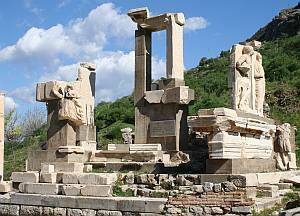 You can join a shore excursion to see only Ephesus or Ephesus and The House of Virgin Mary. Most cruise passengers have enough time to add Ephesus Terrace Houses as well but because of the distance between Izmir and Ephesus area which is about 2 hours and 10 minutes for round trip, unfortunately the places that could be visited are limited. Within a limited time of yours in Izmir, the best thing to do is to join an Izmir excursion and visit Ephesus.